This is a CD full of covers, some obscure, some very common. This sort of release often leaves me flat, but there's something endearing about this CD. It has the spirit without being just a bunch of covers. It's not that new ground is necessarily gained, but the set is quite enjoyable. It is nice to hear a band actually cover the whole of "Malegueña" the instead of just the Trashmen's extract. This is really nice version of the Vy-Dels' tune. It's very trad, well played, spunky and infectious. The respectful delivery is a little less gutsy than the original, but equally enjoyable. Very nice. Mostly unmelodic, this middle eastern/gypsy inspired piece is laden with demented "ay-ya-ya" shouts. It's driven and reverby, but without more of a melody line, it seems a little repetitious. Originally released by the Black Albinos (Dutch band) in 1962. Richard Rogers and Oscar Hammerstein II didn't mean for this to be quite so surf worthy. I think this is just about as good as this tune gets. They have overcome the hokeyness and replaced it with solid surf sensibilities. Excellent. Originally issued in 1962 by the Freedom Riders (Dutch), this is a reverby treatment of an adequately melodic and chunky tune, well twanged out, and very infectious. Jim Messina's most available tune is given a slightly less gutty arrangement that delivers the goods. The sound is less edgie and more wet than the original. Solid and well played. Ernesto Lecuona's oft covered number finds a more flamenco approach than any surf band prior has given it. They actually use the main melody instead of merely amplifying the break into a song. The effect is great. Very cool. Another frequently covered Ernesto Lecuona's tune, this time revamped in a new and more reverent arrangement than most, only topped by the Emperors and the Vibrants versions. Most enjoyable. This fine rendering of the 1963 Patents tune is both reverent and solid. It doesn't jump off the disc, but it sure holds its own. This TV commercial jingle turn top forty hit finds a simple and pleasant surf life here. Not often covered, it's an obvious choice, and the band give it a well healed treatment. The almost mandolin double picked break is especially nice. The Intrepids 1965 obscuro is covered well here. The arrangement is similar to the Surf Raiders', but with smoother production. This is one of those vintage tunes that should be more commonly covered than it is. Very tasty. This Ventures number grinds slowly across the horizon. The whammy and drama work well with the reverb. Hazardous and moody, shimmering and fluid. The Jokers cut this in 1958. 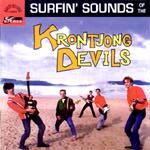 The Krontjong Devils make nice with the reverb in 1996, and presto, the surfability stands out. Excellent. This is a speedy rendering of the Atlantics 1963 track. It's been covered better, but this holds up well. It's not as stinging as the original, but it does work well. Johnny Barakat and the Vestells 1964 single is morphed somewhat, with the sax excised and the the reverb turned to eleven to enhance its surfability. Very nice cover. A million version later... This breaks no new ground, but is certainly solid and entertaining. This is a cover of the Breakers 1964 single. It's relatively obscure, and not very melodic. The catchy riff is OK< but just not enough to carry it off. John Barry's film score, with the British big guitar sound removed and replaced with an almost surf arrangement. Pretty nice. This is the Ventures variation inspired by the TV show, and reverbed into the bay. Weird, but not particularly enduring. Another Jim Messina tune gets the Dutch treatment, with the overdrive removed and the dwell increased. This fine tune, most familiar from the Super Stocks, gets a very tasty performance. It's well paced, a little less damped than the early versions, and still quite reverent. The Teen Beats aka the Nevegans cut this in 1963. It's been covered a few times, most notably by Jon and the Nightriders, who did the best version I think. This is solid too. The melody is very infectious, with its Cossack influences and cool hooks.